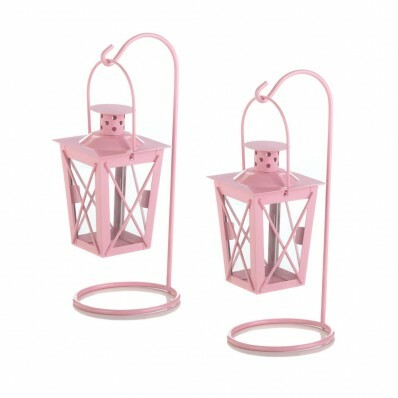 The pretty pink finish make this pair of iron hanging railroad style lanterns a perfect addition to your romantic decor. Soft candlelight will shine from inside and make a great addition to your tabletop, and would be unique for decorating a baby shower perhaps. Candles not included. 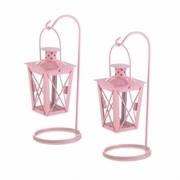 Each is stand 3 7/8" x 3 7/8" x 9" high; each lantern is 3" x 3" x 5" high, 7" high with handle.